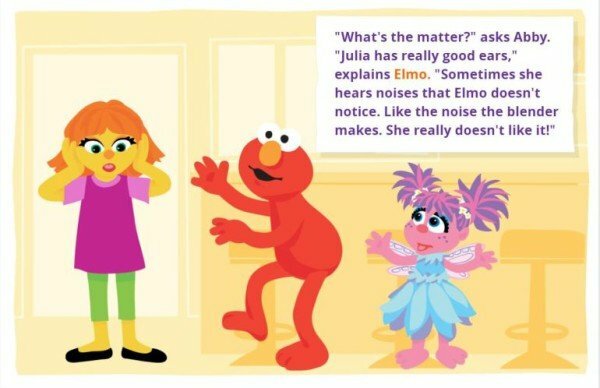 Sesame Street has introduced a new character, Julia, a little girl who has autism. The Sesame Workshop says Julia is being introduced as part of a campaign to take the stigma away from the disorder. The workshop hopes Julia will help those who are dealing with autism. Julia will be portrayed as a girl who “does things a little differently” when playing with her Muppet friends, including Elmo and Abby, the workshop says. “If you’re five years old, and see another kid not making eye contact with you, you may think that child doesn’t want to play with you. But that’s not the case,” Sherrie Westin told People Magazine. Julia won’t feature in the Sesame Street TV show but she will be included in digital and printed storybooks. “Families with autistic children tend to gravitate toward digital content, which is why we created Julia digitally,” said Sherrie Westin. Sesame Street is also producing online tools as part of its See Amazing in All Children initiative, to help people affected by autism manage everyday activities. Their guides, aimed at families with children aged between two and 5, include ones on brushing your teeth, visiting a restaurant and crossing the road.